webbshopp under uppbyggnad vid frågor eller beställningar skicka medelande! Superior shock absorption offers increased ability to sit and ride the gaits, while giving an ultimate close contact feel, and keeps rider’s back stable. 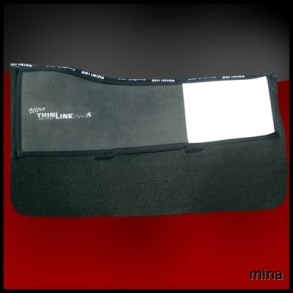 Ultra ThinLine protects the horse’s back, encouraging proper rounding and movement. 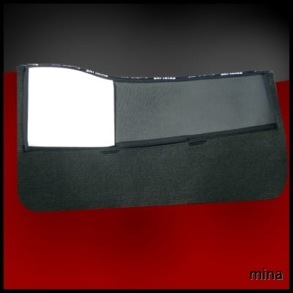 Protect show pads and backs with this liner. Thin enough to be used as a liner, but durable enough to be used on its own. 3/8″ felt with 3/16″ Ultra ThinLine. If you decide to ride it alone, you may wish to add fenders to protect your felt over the years. This liner works great with treeless saddles as well as western saddles. If you need to make saddle fit adjustments, order shims to lift the front or rear of the saddle. Bridging shims are also available for saddles which bridge or for horses with a sway back. 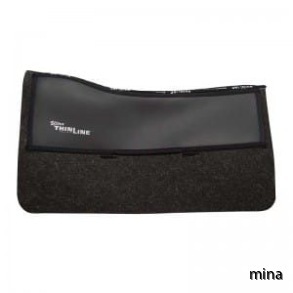 ThinLine allows horses to lift their backs more comfortably, so they will develop better top line and bridging shims may eventually be removed. 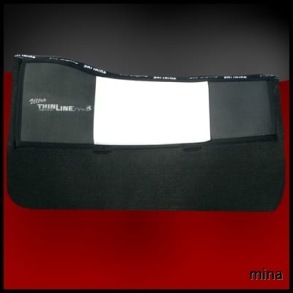 View the product gallery – ThinLine shims are shown on top of the pad to demonstrate size and shape – you will actually place them inside the pad. Shims will not shift once inserted.